Manama, Feb. 12(BNA): His Majesty King Hamad bin Isa Al-Khalifa hailed deep-rooted historic relations and long-standing partnership between the Kingdom of Bahrain and the United States of America. He hailed strong decades-long bilateral ties, which are based on mutual trust, respect and joint coordination, lauding steadily-growing relations in all fields, particularly military coordination and defence cooperation. 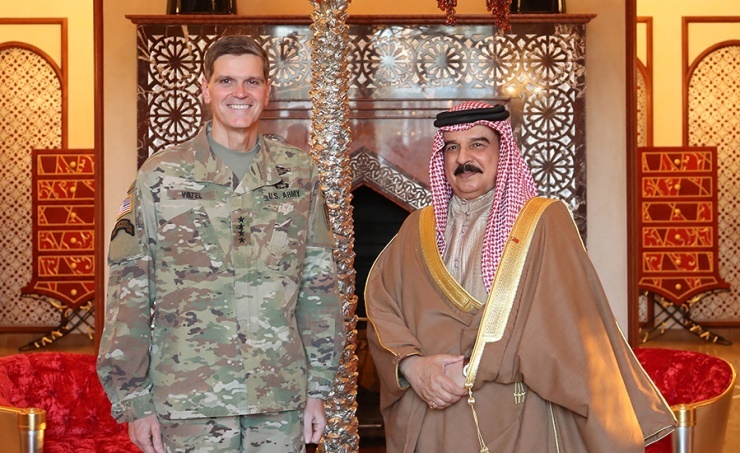 This came as he received at Al-Sakhir Palace, in the presence of the BDF Commander-in-Chief Marshal Shaikh Khalifa bin Ahmed Al-Khalifa, Commander of the US Central Command (USCENTCOM) General Joseph Votel, marking his visit to Bahrain. HM the King welcomed the USCENTCOM commander and hailed the US-led pivotal role in bolstering regional and international security, stability and peace, lauding the efforts of Gen. Votel to strengthen Bahrain-American military and defence cooperation, wishing him success. The USCENTCOM commander expressed thanks and appreciation to HM the King for receiving him with the accompanying delegation, hailing royal efforts to strengthen joint historic military cooperation. He commended bilateral relations and joint cooperation, hailing Bahrain’s support and important contribution to maintaining regional security and stability and joint coordination between the armies of the two friendly countries. He congratulated HM the King on the success of the recent elections and hailed Bahrain’s achievements, wishing the Kingdom further development and progress, led by HM the King.